Declawing cats, or onchyectomy, as the surgical procedure is called, is the actual process of removing the last phalanx (the bone of the finger with the nail) surgically such that the pet is no longer able to claw, scratch, or otherwise use its front nails. 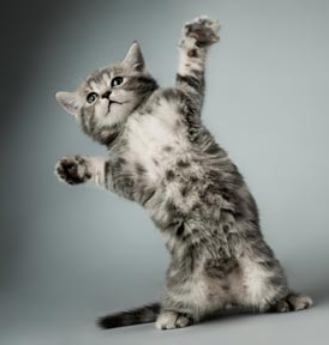 Most owners who elect to have this procedure performed do so because they feel that the cat(s) would otherwise be destructive to furniture in the house, potentially traumatize/scratch another pet in the household or the owner and their family/guests, or have tried alternatives to declawing and have found it challenging and stressful for themselves and their pet. Performed under the right circumstances, declawing is a procedure that allows an otherwise loving and affectionate feline to remain a member of a family that would give it a great home without the risk of injury to other family members, 2 – and 4-legged alike, as well as furniture and other household items. If it is decided that declawing is the direction in which the owners would like to move forward, then at Country Creek Animal Hospital, we perform this procedure under strict adherence to guidelines to assure the pet’s safety, maintain a relatively pain free state (as much as can be accomplished), and promote healing and a measured, slow return to normal activity. Also, we will only declaw the front feet of a cat, not all four feet. The only time that we would do a declaw on the rear feet is if it is medically necessary (tumor, chronic infections, etc.). For those clients opting to declaw, we recommend that the procedure be performed once the pet is 4-5 months old. Older pets can still be declawed, but if we had a choice, we’d prefer to do it sooner rather than much later in life. We find that younger pets tend to heal faster and return to normal function sooner than older pets. Older pets are typically heavier and therefore apply more pressure to the feet causing more pain and discomfort in the immediate post-operative phase. Also, the procedure seems to be more traumatic in older pets in that the tissues that we are incising tend to be tougher and require more pressure to work with. Whereas a younger pet’s tissue tends to be more pliable and easier to work with surgically and the fact that they weigh less and place less pressure on their feet, it makes logical sense that if we can do the procedure sooner, then we should. The declaw procedure itself can also be coupled with the pet’s sterilization procedure. Most young felines need this procedure completed as well. We feel that it is relatively safe to perform both procedures at the same time. An extended hospital stay after the declaw procedure can actually be beneficial to those kitties also having their sterilization procedure done at the same time. We can never underestimate the benefit of forced rest after surgical procedures like these. Veterinarian/Technician have met with owners and discussed alternatives to declawing. The pet is evaluated on the day of the procedure for any apparent health issues that may complicate anesthesia. Routine lab work would be ran on the day or before to make certain that internal organ function is adequate for anesthesia and post-operative medications are safe to deliver to the pet. The pet receives pain medications (narcotics, non-steroidal anti-inflammatories, local anesthesia) prior to the procedure being performed. The procedure is completed on Day 1 of the visit. With the feet bandaged and the pet in recovery, more pain medications and sometimes antibiotics are delivered to the pet to aid in healing, prevent infection, and provide comfort and pain relief to the pet. The feline is monitored and more pain medications are given on Day 2. Bandages are sometimes removed at the end of Day 2. A special type of litter called Yesterday’s News is provided so that the surgery sites do not become clumped with litter. The cat stays overnight on Day 2. On Day 3, the pet receives its last round of oral medications. The injectable pain medications and antibiotics still have a long-acting effect at this time. If not already done, the bandages are removed and the surgery areas are inspected. The pet is discharged to the client after consulting with them about post-operative care and potential complications. Forced rest and restricted activity are still encouraged during this phase of the healing process. Ideally, before a declawing procedure is performed, the owners are educated on alternatives to declawing. The Team at Country Creek Animal Hospital in Allen,TX believes that declawing should only be considered in instances where the owners have considered other options, or at least have been educated on the different methods to provide a similar benefit without unnecessary surgery if possible. These would include the use of an attractant (Cat Nip or Cat Attract), a scratching post, pheromone therapy (Feliway), and the application of a temporary cap on the nails (Soft Paws). These methods used by themselves or in combination with one another can sometimes provide as good or better results than declawing itself.